Hanoi (VNS/VNA) - The pig industry plays an important role in the Asia Pacific, but, like other sectors, is facing challenges such as price volatility, food safety concerns and recently reported outbreaks of African swine fever. Therefore, solutions are needed to promote smallholder pig production in a sustainable way, experts said. According to Fred Unger, a scientist from the International Livestock Research Institute (ILRI), pork is an important part of the Vietnamese diet. Additionally, more than 70 percent of meat consumption is supplied by small scale producers. While Vietnamese consumers have a strong preference for fresh, un-chilled pork sold at traditional markets, increasing concerns over food safety have been expressed by Vietnamese consumers, he said at a regional symposium on research into smallholder pig production, health and pork safety which was held in Hanoi this week. Research conducted since 2013, including risk profiling and assessment for biological and chemical hazards, a cost of illness study and most recently a food safety performance assessment of a range of current pork value chains in four provinces of northern Vietnam have showed that pork is not safe. Between 44 and 82 percent of pork sampled was contaminated with Salmonella, a group of bacteria that normally inhabit the intestines of animals and human. Despite effort paid to the production of safe pork, it has not yet reached a significant share of the market in Vietnam. He also pointed out that key constraints to the uptake including high cost of adoption, lack of visible benefits from changing behaviour and low consumer trust. The fact that Vietnam has joined the Comprehensive and Progressive Agreement for Trans-Pacific Partnership (CPTPP) was also a challenge for the animal husbandry industry as the requirements for product quality and traceability are set higher. Thus, farmers needed to join value chains to meet the demand for producing and supplying safe pork for the market, experts said. Le Thi Thanh Huyen, from the National Institute of Animal Science, said individual households faced poor competitiveness in the market and found it difficult to access resources. While indigenous pigs, such as ‘Ban’ pork, are preferred by consumers and able to be sold at a high price, awareness of food safety is considered very poor among ethnic farmers, Huyen said. 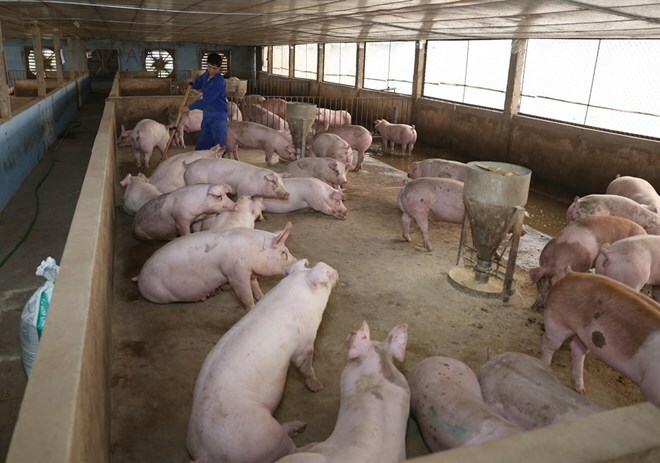 A survey conducted in Da Bac district, Hoa Binh province, where ‘Ban’ pig production is promoted by the Government, showed that most thought safe food could be detected by its physical appearance and blamed chemicals in food as the main cause of cancer, she said. All interviewed consumers thought well cooked pork is safe while fewer people had this view among other stakeholders. Huyen said better communication was needed to improve the awareness of food safety among different stakeholders along the ‘Ban’ pork value chain. It is expected that by improving their practices, farmers’ livelihoods would be enhanced by giving them the opportunity to access potential marketing and branding options. According to Nguyen Thi Duong Nga from the Vietnam National University of Agriculture, the forming of cooperatives was to serve three purposes – to buy feed in bulk at cheaper prices and quality; collecting pigs to sell to slaughterhouses and big traders; to slaughter pigs and supply supermarkets and institutional buyers.